Click product name to view more information. We put two of our state of the art Class A CW amplifiers in a single chassis, and now you can instantaneously go from 0.7 to 18 GHz with the reliability of solid state designs for EMC & EW applications. With up to 60 watts in the first 0.7-6 GHz band split and up to 40 watts output power in the 6-18 GHz split, we put it together for you in one package that costs less, weighs less, and takes up less space than two separate amplifiers. AR has the experience to define and build to your EMC test system requirements. Systems contain high-quality components and are configured by experienced EMC engineers. The result is a system that is accurate, easy to operate, and affordable. Best of all the system selection and integration process doesn’t interfere with lab personnel’s primary function – to test. AR worries about every detail from cabinet shielding and wiring harnesses to the bolts and screws for the final assembly so you don’t have to. And did we mention free automated test software to make testing easier, faster, and more accurate than ever? 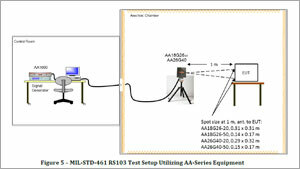 AR’s CI00402 RF Conducted Immunity System is a self-contained test system used for military, medical, consumer electronics, automotive and aircraft markets. The 9kHz – 400MHz user friendly system eliminates setup issues since it contains a signal generator, spectrum analyzer, 100 watt RF amplifier, external directional coupler and AR emcwARe control software. The AR model CL-105A/CL-106A Shielded Enclosure Leak Detection System (SELDS) provides a convenient means of testing the electromagnetic shielding effectiveness of EMI enclosures. The system consists of a transmitter, receiver, headphones and rugged carrying case. The incredible sensitivity of the receiver allows it to meet the most rigid MIL standards (e.g. MIL-STD-188/125) for shielded room acceptance. 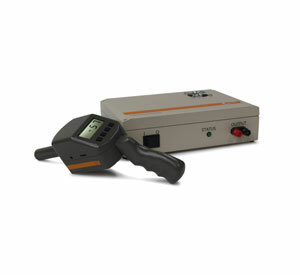 The system features a digital readout display and auto-zeros for reduced setup time. 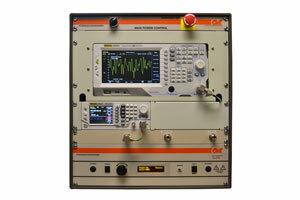 10 kHz-1000 MHz U Series Amplifier, Now Up To 250 Watts! 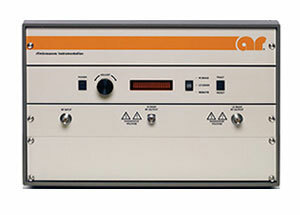 AR’s new family of “U” (Universal) Series RF solid state Class A power amplifiers now includes a 250 Watt model that covers the 100 kHz-1000 MHz frequency range. 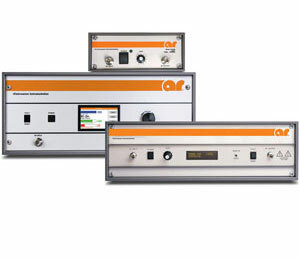 These amplifiers are ideal for EMC, laboratory use, antenna & component testing, watt meter calibration, medical/physics research, and more. This compact, high performance & affordable amplifier joins a family of products available in 1, 2.5, 10, 25, and 50 watt output levels that covers 10kHz to 1000 MHz. AR RF/Microwave’s brand new AA-series field-generating systems are your ideal source for radiated immunity testing from 18 – 40 GHz. The AA18G26 and the AA26G40 are capable of producing fields of up to 50 V/m in either the 18 – 26.5 GHz or 26.5 – 40 GHz, respectively, in an affordable, solid-state design. 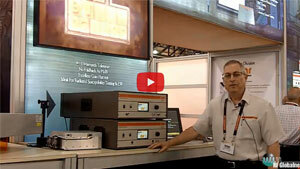 In this video, Joe DiBiase discusses three approaches for improving EMC test lab efficiency. Pressures placed on many labs to increase throughput, without increasing headcount or negatively impacting quality make this an important topic. Areas touched on include: Lab layout considerations, increasing test speed and flexibility through equipment/software, and turnkey systems. 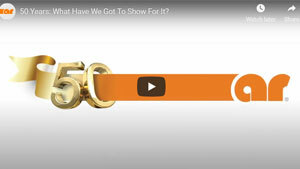 50 Years: What Have We Got To Show For It? 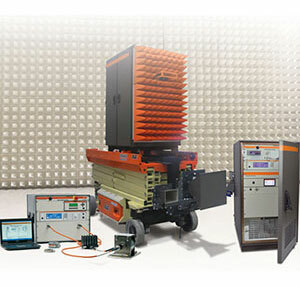 2019 marks the 50th Anniversary of the inception of AR RF/Microwave Instrumentation. What began as two men designing power amplifiers in the basement of a small home is now a multi-national family of companies that includes AR RF/Microwave Instrumentation, AR Modular RF, SunAR RF Motion, and AR Europe. AR’s emcware is a user-friendly comprehensive EMC test software package including automation routines for Radiated and Conducted Immunity, Radiated and Conducted Emissions. Within these test categories, there are over 500 pre-defined test setups already built in. Emcware allows you to log in, store and maintain all of the equipment in your emcware’s dedicated Equipment List. Compared with other EMC test software that is purchased as separate test category packages, you can see why AR’s emcware® is a better alternative. Download this Application Note for features and benefits.